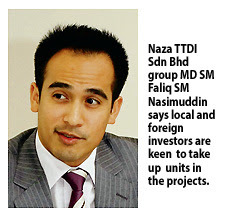 NAZA TTDI Sdn Bhd, the property development arm of the Naza Group is launching three high-rise luxury residential towers in Kuala Lumpur, worth more than RM1 billion by the year-end. Group managing director SM Faliq SM Nasimuddin told Business Times that it will launch one block with more than 50 floors at the company’s RM4 billion Platinum Park development in Kuala Lumpur. This will be the first residential tower at the Platinum Park, currently the largest luxury development in Kuala Lumpur. At Platinum Park, three buildings are currently under construction. They include two 50-storey office towers, each to house the new headquarters of Felda Group and Naza Group, and the 38-storey Tabung Haji tower. The second residential project featuring twin towers, retail and food outlets on a 0.8 hectare is located near embassies such as the Singapore High Commission on Jalan Tun Razak. The indicative selling price for each unit at the two residential towers would be more than RM1,600 per sq ft, based on the current market price, Faliq said. The third residential project comprising 30 floors will be developed on a 0.4ha site in Taman Tun Dr Ismail, or near the Damansara Specialist Hospital. Based on prices of residential properties within the vicinity such as Glomac Damansara and Tropics Serviced Apartment above the Tropicana Mall, Naza TTDI may sell the units at more than RM750 psf. Faliq said local and foreign investors from the Middle East, Europe, Singapore and Hong Kong have approached the company to take up individual units and buy en bloc. The projects are designed to attract foreign investors, in line with the company’s plan to build its brand and venture overseas to build townships and mixed developments. Faliq had said in March that it plans to launch 18 new projects this year worth RM1.6 billion and achieve a turnover of RM1 billion for fiscal 2011. But the company is most likely to surpass RM2 billion, being the value of new launches, with the three residential projects. Kuala Lumpur: UDA Holdings Bhd’s survival now rests on the Ministry of Finance’s (MOF) final decision on the joint-venture partner for UDA’s RM6 billion Pudu Jail redevelopment project. Under fire over the last few weeks, UDA’s chairman Datuk Nur Jazlan Mohamed stressed that the Pudu Jail development is the last lifeline of the group that has RM900 million debt and RM90 million in cash. “I proposed three solutions to the government. To pardon UDA’s debt, to close down this company altogether or to allow us to work with a reliable partner because we cannot afford to fail in this project,” he said in an interview last week. The company has appealed to the government to waive its RM414.3 million loan to Khazanah Nasional Bhd and reschedule payment of another RM385.2 million Treasury Loan. “Even if the loan is pardoned, it still does not solve our problems. We need money to sustain the group and to further expand,” said Jazlan. Although UDA has assets worth RM2 billion, its annual operating cash flow is about RM60 million a year. Its cash reserve is also falling from RM125 million in 2009 to about RM90 million now. UDA has come under attack for allegedly abandoning the Bumiputera agenda after it chose not to appoint local joint-venture turnkey investors for the proposed project. But Jazlan rebutted that there are no Bumiputera companies that are financially capable to take on the project in the first place. “Even if there is, like AZRB, it did not bid for the project knowing well the financial risk involved. If UDA is financially capable, we would have undertaken the project on our own,” he added. The proposed joint-venture partner would have to spend an estimated RM600 million to construct a retail mall complex and a public transportation hub that can house 180 buses. The proposed bus terminal is estimated to bring in between 100,000 and 120,000 people daily. This would help boost UDA’s income via retail space rentals and car-park operations at the new complex. While the ownership of the complex belongs to UDA, the cost to build it will be borne entirely by the partner. Under the joint-venture term, the partner is only free to build offices, residential and hotel after it has completed the main retail mall, after which it can sell or lease the building. “The MOF needs to make a decision on what is best for UDA. Once the retail mall is completed, it can give a recurring income of about RM300 million that can definitely help UDA pay its debt and move forward,” he urged. “UDA is banking on the Pudu Jail redevelopment to stabilise the company. I hope the government won’t give in to the pressure groups and make a sound decision with UDA’s interest at heart,” he said. “In this case, the Bumiputera contractor issue is secondary. UDA’s long-term sustainability is foremost,” he reiterated. Renamed the Bukit Bintang City Centre (BBCC) development, UDA submitted the names of its preferred joint-venture partner to MOF last month. It was earlier reported hat only one out of 11 foreign and local companies bidding for the BBCC project was a fully-owned Bumiputera company. PETALING JAYA: The exact scope of Malaysia Resources Corp Bhd (MRCB)'s involvement in the much-anticipated River of Life project, which aims to revitalise and transform the city's dirty rivers, is yet to be made known. OSK Research said as a result of that, it was unable to estimate the financial impact of the project on MRCB. “Nevertheless, we believe the project will provide a sizeable future earnings enhancement to MRCB. Apart from becoming the project delivery partner (PDP) with Ekovest Bhd, we do not rule out the possibility of MRCB being appointed one of the contractors to undertake the river cleaning project,” it said in a report yesterday. MRCB declined to comment on its involvement in the project when contacted by StarBiz yesterday. Last Friday, Prime Minister Datuk Seri Najib Tun Razak launched the project which sought to transform the Klang and Gombak rivers into iconic waterfronts on par with waterways in cities like Amsterdam, London, Melbourne and Paris by 2020. The RM4bil project is divided into three parts river cleaning, which would involve a 110km stretch along the Klang river basin; river beautification along a 10.7km stretch by the Klang and Gombak river corridor including pedestrian walkways; and corridor development. OSK Research in earlier news reports stated that RM3bil had been allocated for the clean-up of the rivers with the balance for beautification works. MRCB and Ekovest had told Bursa Malaysia in late February that the EkovestMRCB joint-venture (JV) had received a letter of intent (LOI) from the Government via Datuk Bandar Kuala Lumpur for the River of Life project. The LOI, dated Feb 22, indicated the intention of the Government to obtain the services of the Ekovest-MRCB JV as the PDP for the project. The River of Life project is an Entry Point Project identified in the Greater Kuala Lumpur/Klang Valley National Key Economic Area under the Economic Transformation Programme.